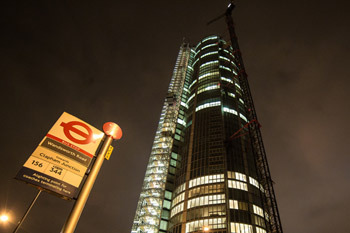 Construction Access Systems Ltd, a British owned Company, was set up in 2010 to develop a modern Common Tower system for the world high rise tower market. Our Managers have the experience of providing access solutions on some of the most prestigious high rise buildings in the United Kingdom, Europe and the Middle East. We are a Company which is constantly learning and understanding the needs and requirements of our clients. It is with this in mind that a new Common Tower System was developed to meet the needs and demands of a modern day construction site. What is a Common Tower? A Common Tower is a temporary structure that is tied to the main building and is used in conjunction with rack & pinion construction hoists to provide access into the building under construction. Why use a Common Tower? 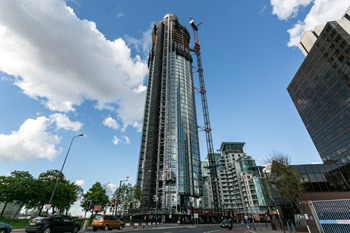 A construction team working on a high rise tower will need to ensure that they have the most efficient access system available for getting personnel and materials to the work face whilst keeping the minimum opening, for access into the building. 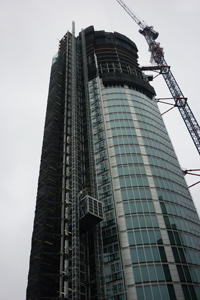 This concentration of hoisting in one area allows cladding to be installed around the open faces of the building, except the small access point to the building from the Common Tower, and then allows for the fit out of the lower floors as the main building is being constructed and grows in height. What can I tie to the Common Tower? A Construction Access Systems (CAS) Common Tower can accommodate conventional twin car single mast hoists, large single car twin mast hoists or a temporary staircase structure on any of its faces. The Common Tower is of a modular design and is capable of adaption to different sizes and shapes to suit various site conditions and to accommodate twin hoists with up to two metres wide. How is the Common Tower installed? The CAS Common Tower is designed for erection and dismantling either by manual handling of the components or by crane handling of large sub assemblies of one, two or three floor Common Tower modules. What height can the Common Tower be erected to? 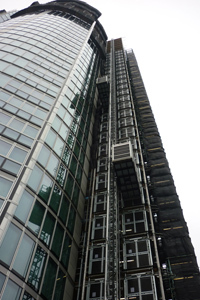 Construction Access Systems Limited’s Common Tower can be used on buildings with up to 70 storeys and heights up to 300 metres. Who will design the Common Tower layout for my project? CAS will provide project specific design calculations and drawing for each project specifying the exact bracing layouts, leg configurations, tie quantities and spacing for the Common Tower System. CAS will work with the Temporary Works Coordinator and design teams for the project and will liaise with other trades on site such as cladding providers and hoist providers. Website Design and Development by Dtex Consulting.